Roman Reigns and Seth Rollins looking at a fallen Dean Ambrose! What a night it was for the World Wrestling Entertainment. The former Universal Champion, Roman Reigns, returned to Monday Night Raw with fans chanting his name in unison. Reigns announced that he's been cleared for an in-ring return. That was not the only surprise WWE gave us on this historic night. After another interference by Becky Lynch, a livid Ronda Rousey relinquished her Raw Women's championship, and in one of the most shocking swerves of the night, Batista made his return to the WWE and attacked Ric Flair to get a one-on-one match with Triple H at WrestleMania XXXV. However, the biggest shock of the night came during a no-disqualification match between Dean Ambrose and Drew McIntyre. A post-match beatdown on Ambrose led to his former Shield brothers reuniting to save the day. Here are 3 possible reasons Roman Reigns and Seth Rollins saved Dean Ambrose. Ambrose probably regrets doing this! 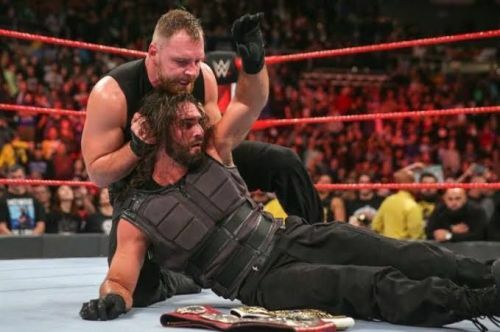 Dean Ambrose turned his back on his brother Seth Rollins the night Roman Reigns announced that he has been dealing with Leukaemia for the past decade. After his heel run turned out to be a massive failure, he started showing a shift in his character. He showed signs of a babyface turn for the past few weeks when he got in an altercation with Drew McIntyre. Ambrose faced Drew McIntyre tonight on RAW in a no-disqualification match. Although a post-match beatdown was imminent, very few people expected Roman Reigns and Seth Rollins to save his former brothers from the hands of Lashley, McIntyre, Elias and Corbin. Seth and Roman cleared the house and then went on to the ramp leaving Dean Ambrose lying on the ring. WWE seems to be building a redemption storyline for Dean Ambrose, and if all turns out alright, he may join his former brothers to join forces against the newly formed stable.